JONATHAN FERRARA GALLERY is proud to announce "Camouflage", the latest exhibition of paintings and sculpture by artist SIDONIE VILLERE. The exhibition is on display from March 4 through March 28, 2009 with an opening reception to meet the artist on Saturday March 7th from 6-9pm. 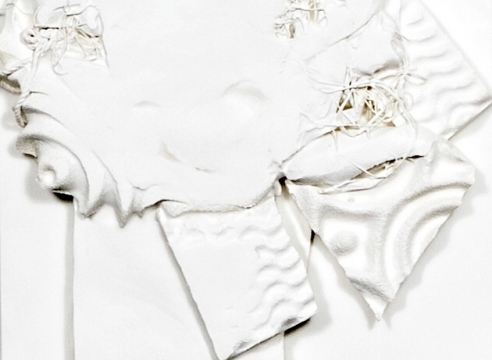 In this latest exhibition, Villere is working with the concept of camouflage and will present an entire gallery of white art works including paintings and sculpture that utilize her signature combination of materials such as porcelain, gauze, fabric, wire, mirror, twine, oil, and canvas. Her ethereal works evoke subtle references to emotional states. "Trying to blend in as a strategy to survive, Camouflage is a series of self-portraits revealing the contradictions of self-preservation." Selected Villere collections include New Orleans Museum of Art, Roger Ogden, Saks Fifth Avenue Department Stores (Boston, San Francisco, Phoenix, Beverly Hills), The late Howard Barnett, James Mounger, Wendy and George Rodrigue, Louellen and Darryl Berger, Dr. Jonathan Lampert, Steve and Dana Hansel. "Camouflage" by Sidonie Villere will be on exhibit from March 4-28, 2009. For more information and images, please contact Jonathan Ferrara Gallery at 504.522.5471. An exhibition catalog will be available after March 10th. SIDONIE VILLERE has a BFA in Ceramics from The Newcomb School of Art at Tulane University and an MFA in Ceramics from The University of Massachusetts, Dartmouth. Since graduating in 2004, Villere's career has steadily gained considerable momentum. As a curator associated with NCECA, she has organized national ceramic exhibitions in New Orleans, LA and Portland, OR. As an artist her work travelled throughout the US in 2006 as part of the New Orleans Artists In Exile exhibition in Atlanta, Louisiana, Miami, and Wisconsin. She has also exhibited in Alabama, Massachusetts, New York and Pennsylvania, In the spring of 2007, Villere's first solo exhibition, Organic Intervention, was a major success with acquisitions by the New Orleans Museum of Art and Saks Fifth Ave Department Stores. In the fall of 2007, her work was featured in the Kaleidoscope Katrina exhibition in the windows of Lord & Taylor's Flagship Store on Fifth Ave in New York. In the spring of 2008, she curated a major sculptural ceramic exhibition, Material, for the NOLA Fired Up conference and had a solo exhibition, Phenomena of Change, in Miami's Design District. In the fall of 2008, her work was featured in The P.1 Projects satellite exhibition at the Prospect.1 Welcome Center at the Hefler Warehouse, and in The P.1 Projects exhibition at the gallery's Julia Street location. Villere's work will be included in the upcoming book, 500 Ceramic Sculptures: Contemporary Practice, Singular Work, by Glen Brown to be published late spring of 2009.